If you were growing up in the ’80s this display panel will be instantly recognizable. It’s the time circuit display which [Doc Brown] built into his 88 mph per hour DeLoren time machine. If this still doesn’t jog your memory (or if — *gasp* — you’ve never seen the movie Back to the Future) take a gander at the montage video below. The thing is, if you look really closely you’ll find this isn’t an exact match. Hackaday alum [Phil Burgess] put together a guide for Adafruit that shows how to build this version. But the movie actually cheated when it came to the month display. In production the month was displayed as alpha characters by painting glass slides. To make that happen here you would need some sixteen segment modules (like in this project). But we don’t mind the change one bit. The nostalgic look stands on its own even if it’s not an exact replica. We’re sure you’ve figured out by now that this is backed by a dead-accurate real time clock (chronodot) and powered by a Teensy microcontroller board. Which means you can use it for just about any of your timekeeping needs. [Professor Shadoko’s] Mac Mini died. 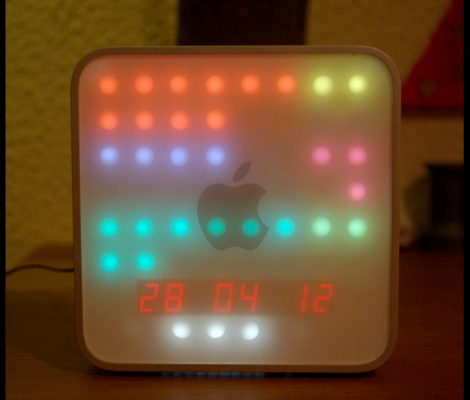 But since the case designs on Apple products are half the reason to buy them, he decided to reuse the enclosure by turning it into this clock (translated). As with the binary clock we saw yesterday, this one uses a bunch of LEDs to display the time, but it does it in a way that’s a bit more readable if you know what you’re looking for. The face has been divided up into two columns. On the left is hours, then minutes and seconds in increments of five. To the right is AM/PM, with minutes and seconds in increments of one. If we’re doing this right, the time seen above is 10:23:42 PM on April 28th, 2012. The white LEDs below the date act as a digital pendulum, scrolling left and right as the seconds tick by. The display uses two MAX7219 LED drivers to control the grid which is build on a big hunk of protoboard. An Arduino ties the whole system together with a Chonodot for accurate time keeping. There’s even an ambient light sensor which adjusts the LED intensity to make this readable in direct sun, or the dark of night. See a demo clip embedded after the break. 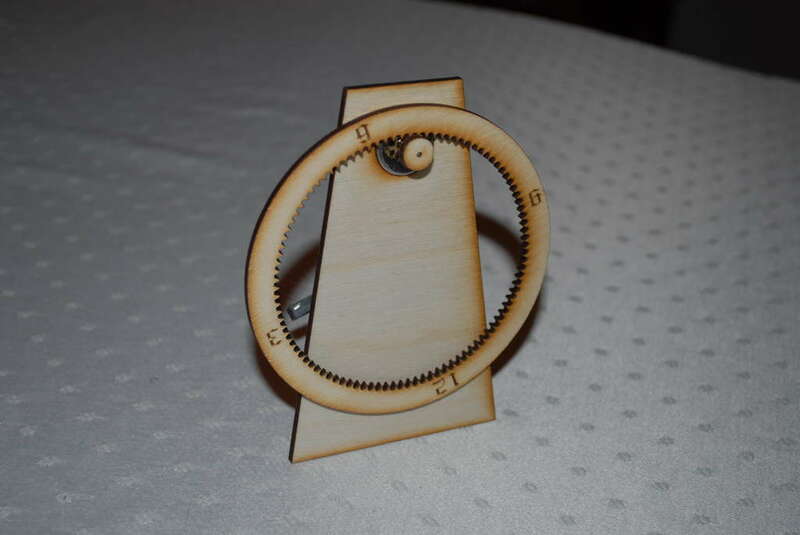 [Brian] from Louisville’s LVL1 hackerspace sent in this laser cut gear clock that’s almost unlike any other clock we’ve seen before. [Brian] also put up a wonderful Instructable for his build. Since LVL1 got a better laser cutter a lot of neat projects have been piling up. [Brian] based his clock around two cheap stepper motors driven by a freeduino. A chronodot was used to keep accurate time. Making the gears, though, presented a few problems. While prototyping the gear clock face, it was apparent that the numbers should be oriented along a line coming from the center of the gear. The prototype also used 100 teeth and that didn’t translate well into a clock design. [Brian] designed the minute gear with 60 teeth, and the hour gear with 144 teeth so that each tooth would equal 5 minutes. [Brian]’s clock is functionally similar to this $2500 gem, and certainly much less expensive even after the cost of the laser cutter is taken into account. Of course, the Spirograph clock keeps track of minutes so it may be worth upwards of $5k. [Alex] ramped up the precision of his timepiece by adding a ChronoDot to the Ice Tube Clock. These two items are among our favorites; the Ice Tube Clock for its old-style multi-digit display, and the ChronoDot for combining a DS3231, battery, and components into a nice small package. There is a schematic link at the very bottom left of [Alex’s] writeup. He mentions that he depopulated the clock crystal and its capacitor pair from the board and patched into the clock input on the AVR. A 100K pull-up resistor is included in the wiring as called for in the DS3231 datasheet. Although not specifically referenced, we assume that [Alex] reprogrammed the ATmega168 clock select fuses to use an external clock signal. Now he can sit back knowing that the clock will be within 10 seconds per year accuracy. 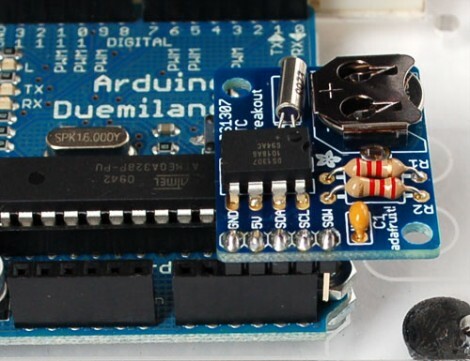 Adafruit’s got a handy breakout board for the DS1307 RTC available. This chip isn’t nearly as accurate as the DS3231 used in the Chronodot but it’s quite a bit cheaper. The breakout makes this easy to breadboard or plug into an Arduino and has everything you need; clock crystal, a backup battery, filtering capacitor, and pull-up resistors. 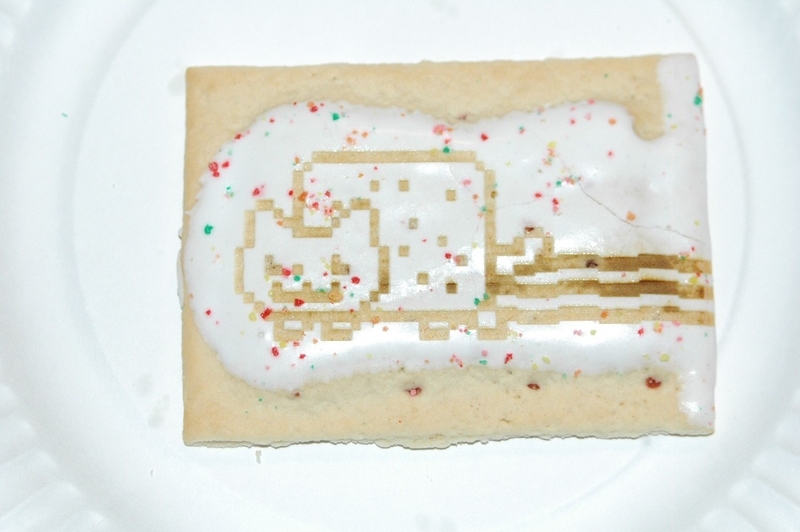 Our favorite part is that Adafruit designs are open source so you can etch the board yourself if you checkout the files from their git repository. This will make a great addition to our prototyping hardware collection. Incidentally, we were surprised to see the choice of 2.2k resistors for the I2C bus pull-ups. We were under the impression that 4.7k was a standard value here. We’d love to hear your thoughts on this in the comments. 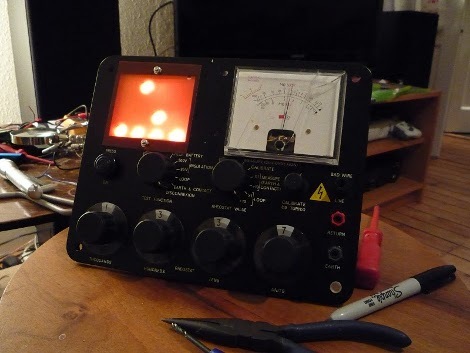 [Kieran] let us know about his hybrid analog/binary clock. The circuitry behind the clock is nothing too new. 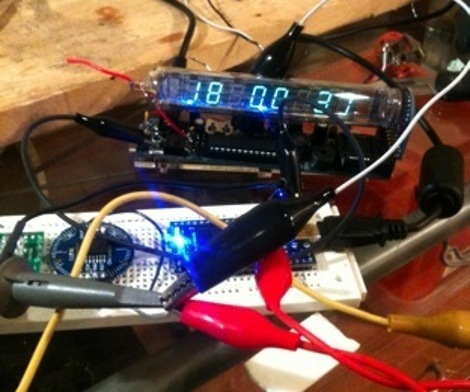 An Arduino combined with a Chronodot to produce an accurate clock. What we really enjoyed however was the creative implementation of an old British Telecom Linesman’s Multimeter as the case. The analog meter acts as the seconds hand, while a another display made of LEDs diffused with stripboard is the binary clock. The end product is nothing short of ingenuitive. Evil Mad Scientist Laboratories has just released a Bulbdial clock kit. This has come a long way since their first prototype, featuring three PCBs to carry the 72 charlieplexed LEDs. For accuracy they’ve included an optional header for a ChronoDot precision RTC. Update: [Windell] of EvilMadScientist.com posted some video of the clock in action. We’ve embedded it after the break.